Is it us, or does it suddenly seem like less is so much more? While the minimalist lifestyle has been gaining traction for a while now, lately it seems the trend has narrowed in on an area dear to our hearts: the closet. Whether it’s Marie Kondo’s often wardrobe-focused tidying technique or Matilda Kahl’s choice to wear one outfit to work for three years, many are looking to trim the fat in their closets. After all, who doesn’t have and resent a large selection of unworn, often low-quality items? We know we’re guilty. One closet-reducing program that’s especially buzzy as of late is the capsule wardrobe. While many have jumped on the clothes-purging bandwagon—blogger Harben Porter has whittled her wardrobe down to 40 pieces, and popular lifestyle blogger Oh Happy Day has cut her closet down to an impressive yet terrifying 12 pieces—the authority on the capsule wardrobe movement is Caroline Rector of Unfancy. Below, we explore what a real capsule wardrobe looks like, Rector’s methodology, what it’s done to change her life, and how to start your own capsule collection. Scroll down to see our how-to and what the capsule wardrobe looks like IRL so you can start simplifying your closet and your life. In the words of Rector, a capsule wardrobe is “a mini wardrobe made up of really versatile pieces that you totally love to wear.” Each season (spring, summer, fall, and winter), you clear your closet except for a set number of pieces to be in your capsule wardrobe. Rector’s golden number is 37 items, but it varies by season. Your capsule collection is made up of a combination of items you already own and love to wear, as well as new, quality items that you can shop for once a season. Learn more details about how it works on Unfancy. According to Unfancy, a capsule wardrobe represents more time, more money, and more energy for the things in life that really matter (i.e., not your clothes). By shopping only once a season, you save money on frivolous items that add up. Rector also says that by narrowing her wardrobe, she was actually able to define and understand her style more. Plus, she always feels like she has something great to put on, as every single item hanging in her closet is something she would love to wear right at that moment. Rector has a five-step approach to building your own capsule wardrobe. Check out Rector’s additional tips and rules for paring down your closet. This easy pairing will be your weekend go-to. The perfect concert outfit, if you ask us. And a scarf for good measure. Denim on denim will never get old. Get more use out of your blazer by styling it with casual pieces, too. Spring is an especially good time to get use out of your favorite jean jacket. Chic comfort at it's finest. Check out our comprehensive guide to tucking in your shirts here. This is making us realize how many uses for a button-down shirt we've been overlooking. Shop more denim jackets here. Tonal dressing is having a major moment right now. You could style this with any pair of shoes in your closet and it would still look good. Sneaker days are the best days. The perfect casual Friday outfit. Give your jeans a break every once in a while and opt for a classic skirt. 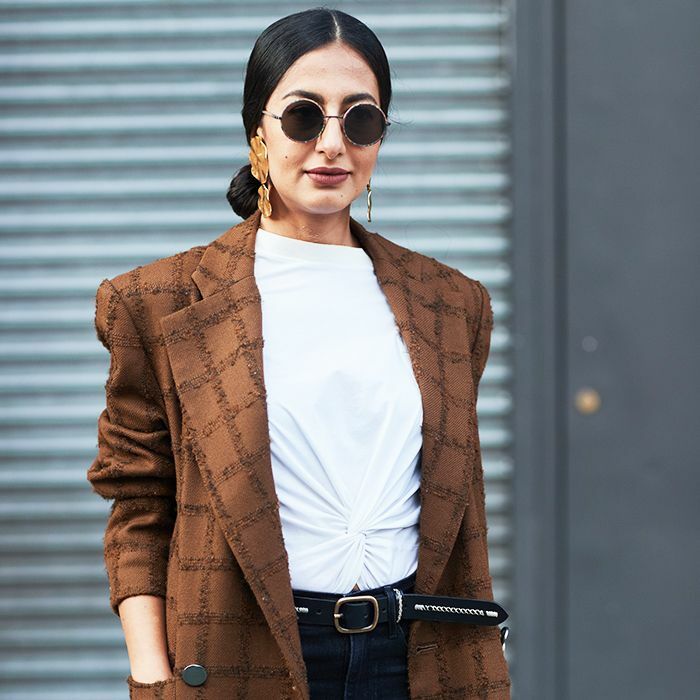 The uniform of so many stylish women. Pointed flats elongate your legs for an always-flattering look. If you have more questions—what about a professional work wardrobe? What about workout or formal clothes?—head over to Unfancy's very helpful FAQ section. This story was published at an earlier date and has been recently updated.